Vamp À N.Y. is very different from the Tuberose Queens such as Carnal Flower, Fracas and Tuberéuse Criminelle. 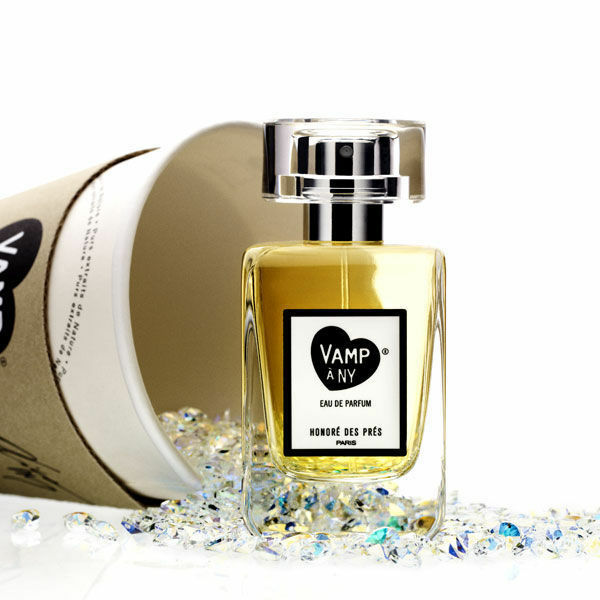 Vamp À N.Y. is more of a Tuberose Princess, more innocent than the Queens but still with a sense of danger and seduction. She is to tuberose what Vero Profumo’s Kiki is to lavender. Vamp À N.Y. opens with fresh fruity notes, a contrast of sweet pear and tart rhubarb. The fruits are blended with sweet rum, which actually feels relatively mute within the composition, it’s there to add a sweet alcoholic hue to the fruit rather than stand out front and centre for all to see. The tuberose comes through pretty quickly and is wonderfully hot, green and peppery with a cool mentholated edge. It is fleshy, camphorous and rubbery, just as it should be. I think that tuberose is at its best when it is allowed to show off its tropical facets, like a rare bird displaying its exotic coloured plumage, and in Vamp À N.Y. the tuberose is beautifully tropical. The best part of Vamp À N.Y. is the bubblegum. As the fruits develop they become richer, jammier and rosy just like bubblegum. As you can imagine, the blend of tuberose and bubblegum is simply heavenly and it gives Vamp À N.Y. a sense of kitsch-ness, fun and naughtiness. It’s cutesy but without being saccharine or sickly. Tuberose/bubblegum form the core of the fragrance and this accord stays dominant for the majority of its development. As Vamp À N.Y. dries down the tuberose softens, losing its menthol and indolic nuances, and is joined by fuzzy, warm and sweet benzoin. I love benzoin, it adds a cuddly texture a fragrance and it works really well with floral notes. The benzoin and tuberose is then joined by vanilla and there are few things more pleasing to the nose than benzoin, tuberose and vanilla. The tenacity of the tuberose is quite remarkable in Vamp À N.Y., it doesn’t fizzle out quickly, it holds strong. In the extreme dry down, all that is left is a sweet soft vanilla which isn’t bad at all, I just find myself re-applying for all of that tuberose and bubblegum fun. I really enjoy wearing Vamp À N.Y. (silly name BTW, it’s not vampish in the slightest), it manages to strike the right balance between bubblegum silliness and serious perfumery. Yes it’s kitsch and fun but it’s also exceptionally well made and it is a new take on tuberose. Now I just need to get a bottle! 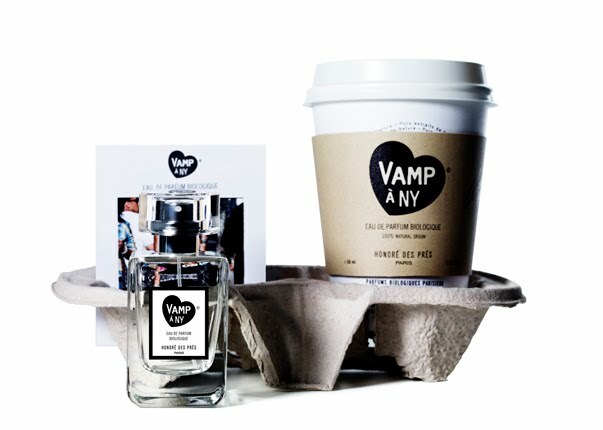 Vamp À N.Y. comes housed within a simple bottle that itself is housed within a New York Style takeaway coffee cup. The packaging is simple, quirky and presumably recyclable. It’s refreshing to see new packaging ideas in an industry filled with dull boxes. The coffee cup adds to Vamp À N.Y.’s kitsch-ness. Posted in Feminine, Floral, Fruity, Honoré des Prés and tagged Bubblegum, Chic, Honoré des Prés, Kitsch, Perfume Review, Tuberose, Vamp À N.Y.. Bookmark the permalink. I’m so glad you sent it! I can see why it would be the one you wear most, it’s quite casual for a tuberose. The bubblegum is definitely front and centre with the tuberose in this one, so maybe you won’t like it so much. She does look cool doesn’t she?! Funnily enough I have just tried Carnal Flower today, so far I am loving it, I have also just blind bought Le Labo Tuberose 40 today (don’t judge me) It is only a 10ml though so not quite so scarey, I am determined to love tuberose by the end of this. Never heard of this til now and it seems awesome!! I’m interested to see if the bubblegum note a) lasts and b) doesn’t smell tacky. It does last and it isn’t tacky. It’s interesting that they’ve managed to create such an accurate bubblegum note without the use of synthetic molecules. I love it, I’m just debating whether to put it in the guide or not. Hmmm. Oh! I’m very curious about this one now. The only thing that puts me off is the all-natural designation – usually naturals have a tragically bad longevity on my skin. How does this one fare for you versus some of your other favorites? The longevity and strength are surprisingly good for an all-natural scent, it has quite a bit of oomph. Of course it doesn’t live up the somewhat nuclear-strength of Carnal Flower of Fracas. When this first came out a lot of people were raving about it but I was wary because of the tuberose. After reading your review however, I think this is a tuberose I could get on with (so far only Nuit de Tubereuse which isn’t much of a tuberose, apparently). I very much like the sound of the supporting notes and that you say it’s not as full-on or vampy as it’s name. Thanks for opening my eyes to this one. I’ll now give it a try when I get the chance. There’s nothing to fear with this one, despite the fact that the tuberose is quite strong it’s never overbearing or too indolic. I have no idea why they called it ‘Vamp’, it’s not in the least bit vampish. Nice to see another guy who rocks Vamp A NY.. I wrote it up last week http://notablescents.net/2012/01/11/honore-des-pres-vamp-a-ny-fragrance-review/ and love wearing it out when I am spinning. I do love the thought of bubblegum fragrances and am still desperate to try ELdO’s Encens et Bubblegum as I think I’ll love it! I thought the same as you until I tried it, it’s kitsch but it’s not ‘teenage-girl’ like. It’s fun but it means business. If you e-mail me your address I’ll send you a sample of Encens et Bubblegum. Hi, I’m new here, but couldn’t resist to thank you for this complete and competent review of one of my favourite floral fragrances! When wearing it I feel like handling a big, soft, rubbery and sweet pumpkin, not much for the scent (even if I catch pumpkin hints) but for the sensation I get… And the drydown is sooo languidly long, as you say, and the vanilla- benzoin- tuberose base is almost moving, for me. It’s interesting that it has that pumpkin-like texture for you. It’s a great scent.